Joe Chamberlin, CEO of the West Michigan Whitecaps, announces the purchase of the Traverse City Beach Bums and Wuerfel Park Wednesday. After 13 seasons in Traverse City, the Beach Bums are out. 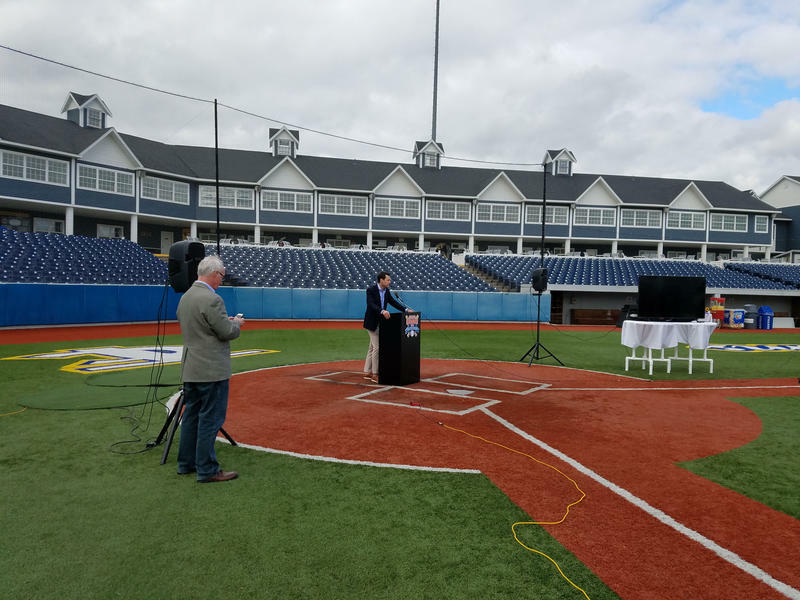 A group of investors led by the West Michigan Whitecaps announced the purchase of Wuerfel Park at a press conference Wednesday. They’ll start a new team that will play in the Northwoods League, a summer baseball league for top college players. 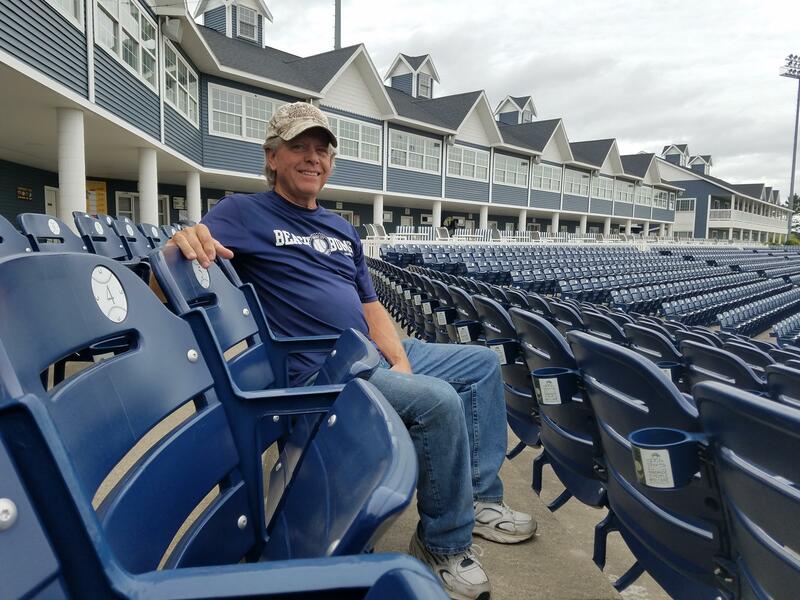 Max Johnston talks with Dan Wanschura about the new baseball team coming to Traverse City. The Northwoods League is a wood bat league made up of 22 teams across the Midwest. It includes three teams from Michigan — Battle Creek, Kalamazoo and now Traverse City. The teams are made up of some of the top college players in the country. Over 200 Major Leaguers have come through the Northwoods League, including players like Max Scherzer, Curtis Granderson and Chris Sale. “You will see what future Major League Baseball is going to look like,” he says. Over the past eight seasons, attendance for Beach Bums games has been on the decline. For example, the average attendance for the 2018 season was 2,261 people per game, filling just over one-third of the stadium’s capacity. John Wuerfel, the previous owner of the Bums, says a lot of that was due to his lack of experience with fan and community engagement. Beach Bums co-owner John Wuerfel plans to retire to his ranch in Leelanau County. Wuerfel says Chamberlin and his staff will do a better job at consistently filling seats and using the stadium to host non-baseball related events. Fans in northern Michigan have a lot of different activities to choose from during the summer months. 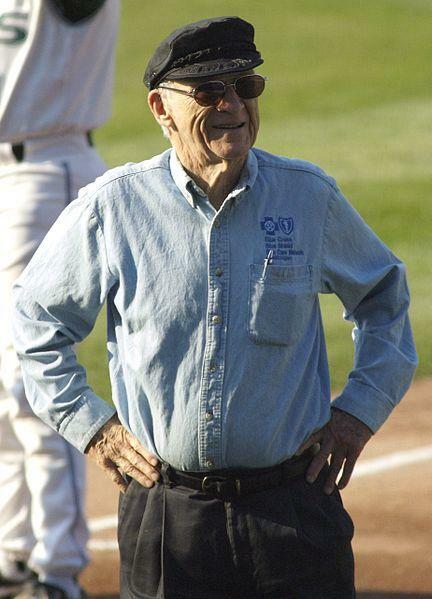 But the Northwoods League is approaching those fans not as a prize to be won, but a match to be made. Gary Hoover, the president of the Northwoods League, says something new will be experienced in the ballpark next year. The Kalamazoo Growlers, for example, have developed some unique food items over the years. Items like the Growler Burger — a bear claw with a burger, macaroni and cheese and some barbecued pork stuck in between it. Hoover says those sorts of things appeal to everybody — not just baseball fans. Currently, the new team doesn’t have a name. Joe Chamberlin announced a contest in which fans can submit name ideas for the new club. To submit an idea, click here. Or, at least Spring Training is in the air. Before the first pitch, baseball fans expect to hear the national anthem performed by countless individuals throughout the long season. The Traverse City Beach Bums open their home season this Friday night. Playing his fifth season with the Bums this year, is veteran Jose Vargas. Ever since he was young, he’s dreamed of playing in the Big Leagues. And at age 27, Vargas has given himself one more chance to turn his dream into a reality. The Traverse City Beach Bums open up the Frontier League Championship Series tonight at Wuerfel Park. The Bums host the River City Rascals for three games in a best-of-five series. When the Beach Bums started the 2015 season, they were coming off their worst season in franchise history. Manager Dan Rohn says it’s great to see the team’s hard work this year, pay off.